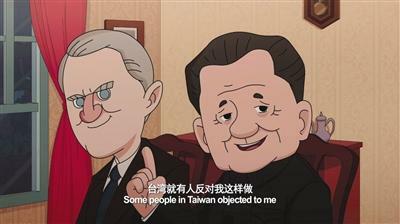 Animated images of late Chinese leader Deng Xiaoping are shown in the upcoming documentary Mr. Deng goes to Washington. The historical documentary Mr. Deng goes to Washington, which premiered in the capital on May 12, not only reveals the details of an attempted assassination of Deng, but is also the first time animated images of China‘s leaders have appeared on the silver screen. The film tells the story of Deng‘s nine-day visit to the US in 1979, only a month after China established diplomatic relations with the US for the first time after the founding of the People‘s Republic of China in 1949. Lu Muzi, the film‘s producer, said the film includes 12 animated sequences of Deng, drawn in French, American and Japanese styles, as well as China‘s traditional shadow puppetry style. “We specially asked Deng Lin, the eldest daughter of Deng Xiaoping and also a renowned artist, to give the final approval. Shortly after we sent her the tape, she phoned us and said we were good to go,” said Lu. “Deng‘s animated images are not static in the film. When he‘s at meetings, the images are more serious, and when he‘s at a gala, he‘s portrayed in a more lively way,” said Zhu. For the young animator, animation can tell the story of that period of history better to younger viewers. Zhu said he and the team went through a lot of historical documents and reviewed video footages in the process of creation. The film includes footages of an attempted assassination by a Ku Klux Klan member as well as scenes of protesters rallying against Deng. Details of the visit, including TV interviews with political heavyweights such as then-US president Jimmy Carter and national security adviser Zbigniew Brzezinski, are also weaved into the film. Fu said the film is in honor of Deng‘s contribution to China as well as his influence on generations of Chinese people. Production was completed last year, which marked the 110th anniversary of Deng‘s birth and also the 35th anniversary of Sino-US diplomatic relations. The film will open nationwide on May 15.